There was two questions asked to me lately that stuck with me. One was, “Why the hell would you make something like that?” The other was, “What do you do for fun?” These two questions are, in a way, the same question. I think I should start with the latter question first. That one actually answers the first. The question was brought up by a friend who didn’t want to drink alcohol anymore, and he was trying to figure out what there is to do, as an adult, that doesn’t involve drinking. The answer to that… well different people are going to have different answers. Some would of course answer with a religious activity, but we are actually talking about something “fun” to do. If fun didn’t matter, you could just clean. No, we are talking about something fun, but rewarding. So the real question is, what do you consider fun? And what can bring something for you? My answer is, I build an electronic russian roulette game. What else are you going to do? No seriously, I have no idea. I can watch TV, but then the more I watch the more useless I feel. I can go out and be with people. That’s fun, but that doesn’t get anything done. There are many things one can do, but for me, they need a result. So, all I know to do is to stay busy. So that answers what I do for fun, and it answers the first question. I built an electronic russian roulette because I can, some kind of fun will be had from it, and what the hell else am I going to do? I was bored over the holidays. When I get like this, I have to create, but what? Right now, I am dry. I don’t have any good ideas. That’s alright, because I had a run of clever ideas. I need to recharge. So when I get like this. It’s time make something out of the material that I already have. Spend no money. Turn the crap you have into some better crap. Several years ago, a friend came over with a friend who was trying to make this stool that would shock the person sitting on it. He found this circuit online, bought it, and couldn’t figure out how to make it work, and that’s why they wanted me to take a look at it. The instructions were horrible. I didn’t know what it was saying either, so I had a closer look at the circuit. The first thing I noticed was that the circuit was not made for what it was being sold for. There were empty slots for other electronic parts on the board. It did something else, and someone just figured out it shocks the crap out of you. So they sold them online. I can’t find them at all now. After understanding the circuit, I figured out how to make it work and I built them a shocking stool. As we were playing with it, all I could think of was, “why don’t I have one of these?” After they left, I went and found the website and ordered one myself. I also made a shocking stool. I used it in my act at one point, and had fun with it at parties. But it got neglected, thrown in a shed, and went to pot. The electronics still worked though, so it became material for the next project. The idea of an electronic russian roulette just popped into my head. Probably because I have been doing more electronics lately. I programmed a 14 pin PicAxe chip to do the roulette game, and I connected the shocking circuit up to it. 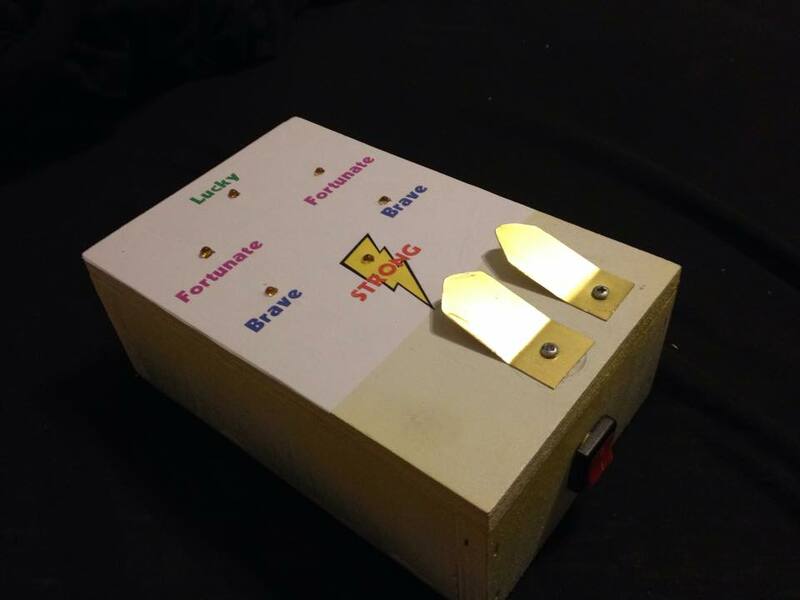 Then I put it in a box, painted it, and added some teasing labels to the LEDs. Then I had to test it. I had to keep doing it until it shocked me. It was nerve wracking but it finally worked. Once finished, it was time to see who would do it. It’s really a study in psychology. Some people have no problem doing it. They will do it until it shocks them. Others won’t even think about doing it. We call those people wussies. Some will do it once, more than likely not get shocked, and never do it again. Some do it and get shocked. Some like the test of chance with bravery. Some don’t actually “like” it, but they understand the mental reward that you get. All to say, “you did it”. So push your fingers down on the brass pieces and take a chance. It’s a metaphor for life. And if you want to know how bad the shock is… Well, do you know those toys that shock you? It’s worse than that. Do you know those electric fences? It’s less than that. Good luck. Previous Article Why does the Tamasudare cost $200?